Sports activities and programs are designed to meet the needs of everyone and all ages. 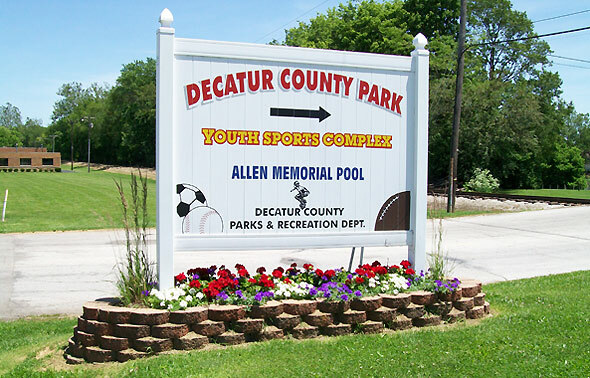 Volleyball leagues, softball leagues, youth baseball, youth tackle football, youth soccer, the Tiger Sharks Swim Team, Greensburg Power of the Past, and open gym times are all a part of what the Decatur County Parks & Recreation offers and hosts throughout their parks for Decatur County. We have clean restroom facilities. Our parks have approved a tobacco free policy that does not allow any smoking in any of the buildings. We offer a three-week camp for children with special needs in Decatur County. The camp, under the direction of Stacie Reisman, is held at the Decatur County Park in June. There is no charge for the program. Daily activities include games, arts and crafts, swimming and more. Several local field trips are planned to give the children a hands on learning experience. This year’s Camp Rainbow is being sponsored by the Decatur County Community Foundation.